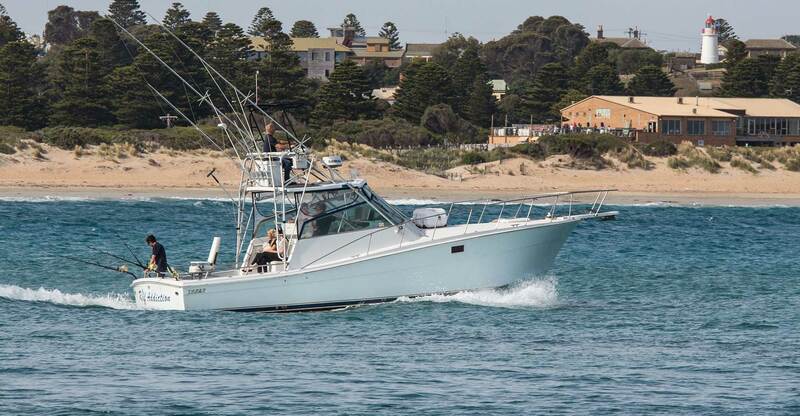 This particular boat is a custom built G.R.P sportfisher powered by twin 10.5 litre caterpillar diesel engines giving a top speed of almost 30 knots. Coupled to an impressive array of electronics including Furuno-simrad- lowrance and Garmin echo sounders with 1x1600w 2x1kw transducer and 1x3kw transducers, state of the art 7", 9" and 12" chartplotters 4G radar VHF, and H.F. She has a long history of raising fish in the U.S. with her deep throaty note... and WOW we have seen this trend continuing. Radios as well as sat phone, charging points for mobile phones etc. all contribute to a great day on the water. She is the ultimate set up for the serious off shore fisherman. And if bashing your way to the continental shelf in a trailer boat doesn't appeal then this is the boat for you. Try our cappuccino machine, Bose stereo, air conditioning, flat screen TV and DVD player, microwave, toilet, shower and lounge, or perhaps a snooze in the forward stateroom! But if fishing is not your thing, a luxury cruise along the South West Coast is a great way to spend the day.